Tripawds » I'm A Star! Before we left town on our Full-Time RV Adventure, my people took me to see their friend Sam at 4 Paws & Wet Noses in old town Eureka as they made the rounds saying goodbye to folks and running last minute errands. Purely by coincidence, we discovered that the Miles Of Smiles pet photographer was set up there taking pictures of pups. 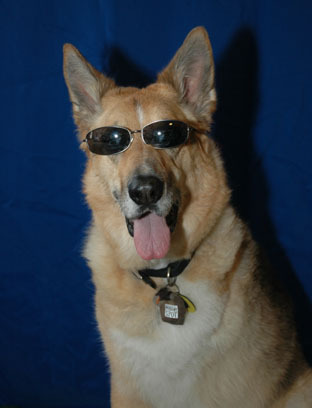 My people couldn’t resist, but also didn’t believe she could actually get me to stay still with sunglasses on my head. Normally I wouldn’t, but I figured it would make them happy. Whatch’ya think? Do I look like a rock star or what? Check out my Gallery Page for more photos and watch my three-legged dog videos.